November 7, 2016 – This week, we bring you our first book in a graphic format, and our first guest time-traveling with us from France. Marcelino Truong is author and illustrator of Such a Lovely Little War: Saigon 1961-63 . 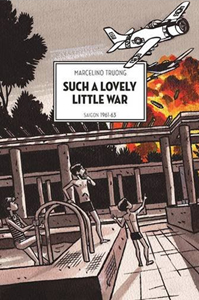 This graphic memoir shows us America’s early involvement in the Vietnam War, through the eyes of young Marcelino, the son of a Vietnamese diplomat and his French-born wife — whose bipolar disorder adds another dimension of conflict to the family’s life. You can learn about our guest and enjoy more of his work at MarcelinoTruong.com. Note that his website is in French, but, his illustrations speak to everyone regardless of language.